A new pocket virtual reality viewing system called Figment that recently launched over on the Kickstarter crowdfunding website, has already blasted past its required $75,000 pledge goal in just the first 48 hours after launching. The Figment VR pocket sized virtual reality viewer has been designed by Quantum Bakery and was available to back at an early bird pledge price of just $49 providing a considerable saving over the regular retail price that will be $79. The foldable virtual reality viewer comes in the shape of a smartphone case that has integrated viewing lenses that flip over to the correct distance from the screen. Watch the video below to learn more about Figment and its design, as well as the applications you will be able to enjoy to view an immersive world of virtual reality. The development team behind Figment explains a little more about its inspiration and design. What dreams do you have? Never lose your child-like curiosity. 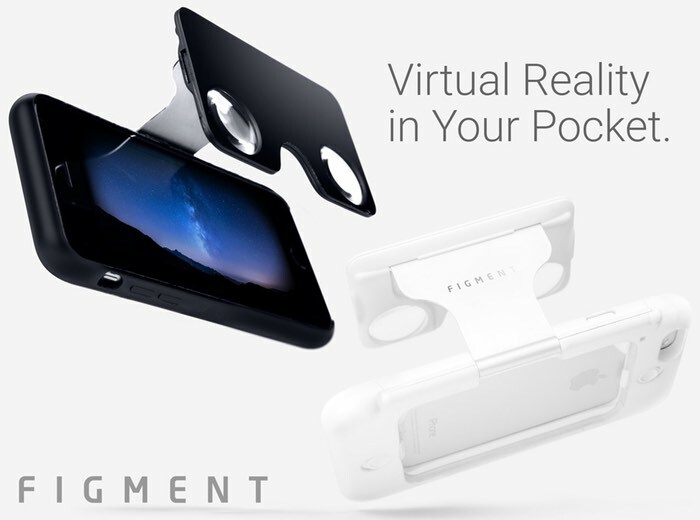 With the world’s first Virtual Reality viewer in an iPhone case, you don’t have to. Figment VR let’s you can take your dreams and imagination with you. You can explore amazing places, from Mt.Everest to the great barrier reefs – immerse in virtual reality. Here is a fun video showing how you can share amazing journeys with friends using Figment. For more information on Fitment VR jump over to the Kickstarter crowdfunding website to make a pledge and make sure you own one of the very first of the production lines when they start shipping during March 2016.